Frances Spalding’s long awaited twin biography of John and Myfanwy Piper is being reprinted less than a month after its appearance. This is something almost unheard of in the small world of art history books. So either there is currently a Piper resurgence, or the OUP has badly underestimated the demand, or both. Or perhaps people want to discover more about the hitherto neglected Myfanwy, who among things, was Betjeman’s muse. But there is no doubt that John Piper has some incredibly dedicated fans. The Net is full of them. One of the most devoted is Ken Hayes, whose John Piper site is admirably comprehensive. People who can’t afford paintings by Piper tend to collect the books written, designed or illustrated by him. I’ve already dealt with the Shell Guides series in an earlier blog, but there are so many other Piper items worth collecting. Some are very obscure and very expensive indeed. Take his first book, published when he was just 18-- The Wind in the Trees. I’ve never seen a copy of this book of verse which Piper’s dad got the Horseshoe Publishing Company of Bristol to bring out in 1921. Even Hayes admits to not having found a copy. Presumably they exist somewhere, or is this another et tu Healy situation ? Piper’s second slim volume, The Gaudy Saint, which appeared 3 years later from the same publisher, is only slightly less scarce. Blackwell’s have a copy at a hefty $942. Then in 1925 Piper senior paid the Curwen Press to publish his memoirs. Sixty-three Not Out would be unremarkable without the 19 tiny vignettes by the twenty-two year old artist, by then planning to leave his post as a clerk in his father’s law firm for art school. About 20 years ago I actually found a copy marked at £10 in the basement of a shop in Cecil Court ( I forget which one ), but rejected it as a bit peripheral. What an idiot I was! I’ve never seen another copy since, but Maggs now have one priced at $707. Drat it ! Brighton Aquatints (1939), Piper’s first important book, is not seriously scarce but is always sought after. There is a tale that Betjeman coloured in some of the aquatints, but I’ve never actually seen a coloured version. 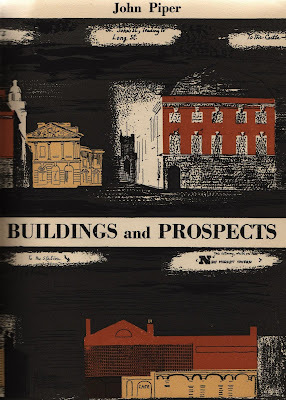 Incidentally, Piper also contributed an aquatint as a frontispiece to S John Woods excellent John Piper: Paintings, Drawings and Theatre Designs (1955) and this too I have seen coloured in, though it looks better uncoloured. Myfanwy once gave me one of these prints from a pile hanging around at Henley Bottom Farmhouse after Piper’s death. 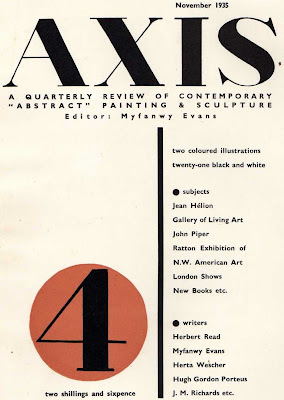 A few years earlier she had very kindly presented me with a whole run in mint condition of the incredibly scarce Axis, the avant garde art magazine she had edited in the thirties. For this I will be eternally grateful. I would never have been able to afford such a treasure otherwise. 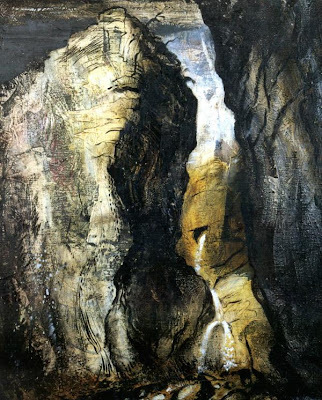 Below is a splendid Piper painting - Gordale Scar, Yorkshire, 1943. Neither Colour in the English Country House nor The Wind in the Trees are in the BL. I always liked the story of Piper painting Windsor Castle in 1940. He produced super-neoromantic paintings with the castle lashed by lightning and rain in high winds under a full moon. At the exhibition George VI said to Piper "It's a pity you had such dreadful weather on your visit." If not true, it ought to be.